This kitchen is in a struggling-bohemian-bro-pad on the television show Smash. Even though it is a curated wreck, I still find is charming. I think the reasons it pulls it off, even though it is a houseware bramble, is the lack of branded logos (because showing that on tv is a nightmare). I always thought that the only way open cabinets could work is if they were functionally useless or if the kitchen owner was a neat-freak. Drew Barymore's Flower Films kitchen is an example of the neat-freak scenario. It's immaculate and everything has a little basket or bin. Bla bla bla yes I know that this picture is styled. 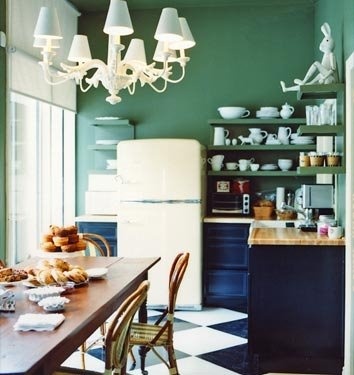 Even though these thee kitchens are more colorful, they are just as styled. I am a pretty Type-A about kitchen disorganization, so I think I could live like this, but be honest with yourself. Could you keep this up? Could you make anything other than cereal and milk in these kitchens? 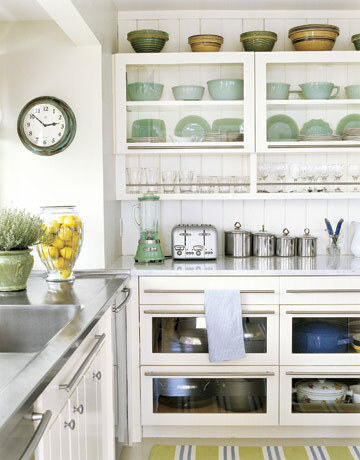 But then I found this image on Southern Living , and it made me feel like real people could have open cabinets and they be both functional and lovely to behold. True, they are still keeping their logos to a minimum, and this room is clearly styled, but it gives me hope.